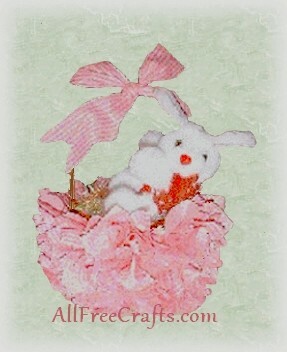 Here’s a no-sew method, using lots of small fabric squares, to make a pretty fabric Easter basket for all your Easter goodies! 1. Cut out a 3″ x3″ inch square on heavy cardboard like a cereal box. This is your template and you’re going to use it a lot. 2. For my small basket, I cut out 160 squares. If your basket is bigger you will probably have to cut out double this amount. Cut the squares with pinking shears. I think it would be pretty if you did different colors of material in rows – like some pastel material and/or patterned fabric in one row, with solid colors in the next row. 3. Take your screwdriver and put it in the middle of the square, on the wrong side of the fabric. Starting at the bottom, and going all around the basket, poke the square into a gap or hole. Repeat this step in a pattern from the row at the bottom. There will be a line of material going around the inside of the basket. Follow this line going up the basket. Finish to the top all around. 4. If the material that you poked through to the inside is loose, or falling out, just apply a little hot glue to the inside to fasten. 5. Make a bow out of a strip of material and tie it onto your basket at the top or side of the handle. 6. Fill with Easter goodies, or use your special basket to present someone with an Easter lily!